After finding very unfavorable conditions on shore, our boat captain suggested we try a "blue-water" dive and see what comes by. The idea sounded very exciting, and I quickly said "yes!". We were near Point Vincente, in Los Angeles County California. We then motored 4 1/2 miles off the California coast towards Catalina Island, where the bottom was 2,000ft below us. The boat engine was turned off, the anchor was dropped down 80ft into the depths, and we started suiting up. 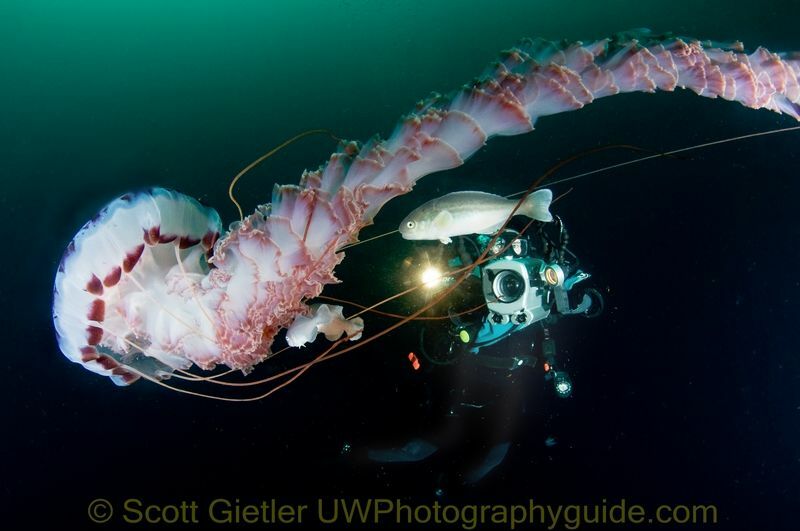 Diver with salp chain, on a blue-water dive off the coast of Los Angeles. What would happen? Would I drift into oblivion? Sink to the bottom? Get eaten by sharks? The boat just slowly drifted. I jumped into the water and descended. Swimming to the anchor line was easy, because that boat and I were moving together with the current. I slowly descended. Hanging on the anchor line at 60ft was an unbelievably relaxing experience. The dive was surprisingly exciting, because you never knew what would come by. 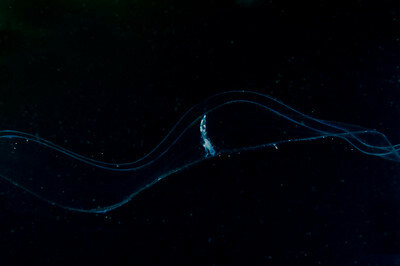 I saw dozens of pelagic gastropods, some pelagic Tunicates, many comb jellies and a few Cnidarians (Jellyfish). All are excellent underwater photography subjects. Although I was attempting a "blue-water" dive, the water was quite green, with heavy "snot" in the water. 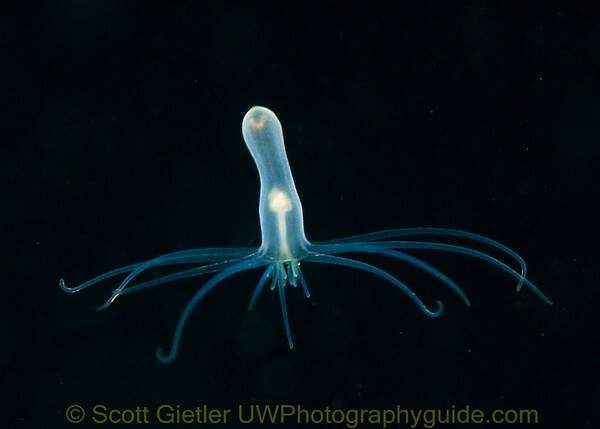 However, it did clear up a little at 75ft depth, and the species I saw down there were different. If you are lucky, large jellyfish can be spotted on blue-water dives during certain times of the year. Tokina 10-17mm lens. Letting go of the anchor line was not a problem. The boat and I were drifting together. Because of my drysuit and camera, I travelled slightly faster in the current, (or maybe the wind pushed the boat faster?) so I preferred to hang on to the anchor line. If I ever lost sight of the line, I would have to surface and swim to the boat, which I felt comfortable doing. Maintaining my buoyancy was quite easy, and I felt like my breathing was relaxed and gas consumption was low. Unfortunately there were no sharks to be seen. Although I never saw anything large, it was a great experience that I can't wait to do again. Next time I might try my macro lens for sharper photos. I think my macro lens behind my dome port might be perfect. But of course, then a whale will swim by. My fisheye lens was a little too wide for most of what came by, but I made the best of it. The heavy particulate meant lots of backscatter, and lots of playing around with my strobe positions. Clear pelagics can be hard to focus on, so for much of the time I pre-focused my lens on the anchor chain a couple inches from the dome port as an experiment, and then switched my lens to manual focus so there would be no "hunting". Normally I tell people to shoot "upwards", but on this dive I found out shooting downwards gave a darker background, which looks better with these clear subjects. 2) Motor out to the open ocean. 500ft - 2,000ft depth is a good range. I like to target the "shelf" areas that drop off more rapidly than other areas. Study the nautical charts before you go out, to find a good area. Hopefully you are going where the jellies are! Jellies may be seasonal. Now (April) seems to be a hot time in Southern California. 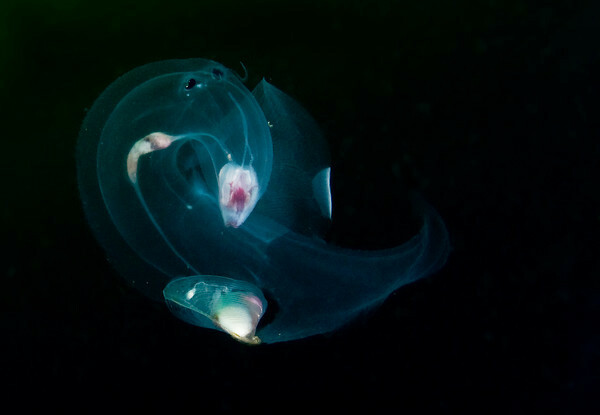 Morning may be better as there is less wind, but on my last dive I started seeing larger jellies in the afternoon. 3) Drop the anchor line down 100ft, or tie a weighted 70 or 80ft line to the side of the boat. Jump in the water and follow the line down. Make sure someone stays on the boat. Stay down as long as possible for maximum jellage. 4) Make sure you read the safety tips below! You may want to make yourself a tether, read on. I felt very safe and relaxed on the dive. If you're concerned about floating away from the anchor & boat (this could be *really* bad if you and the boat move differently in a current or the wind), either keep hold of the anchor line, or attach yourself with a tether. For mild currents without much wind, you are moving at a similar speed as the boat, so there is not much danger, because if you lose sight of the line you can always just surface and swim to the boat. If the wind picks up, the boat will start moving faster than you, so you will probably want a 10-15ft tether. To make your own tether, just buy a 10ft to 20ft strong rope, with a strong clip on one end (to clip to your D-ring), and a carabiner on the other end to go on a anchor line or chain. You'll probably have to know how to make some good knots to put all that together also, luckily a friend made my tether for me. I've used the tether on 2 out of my 7 dives, only when I feel like I lose the anchor too quickly when I let go of it to photograph a jelly. 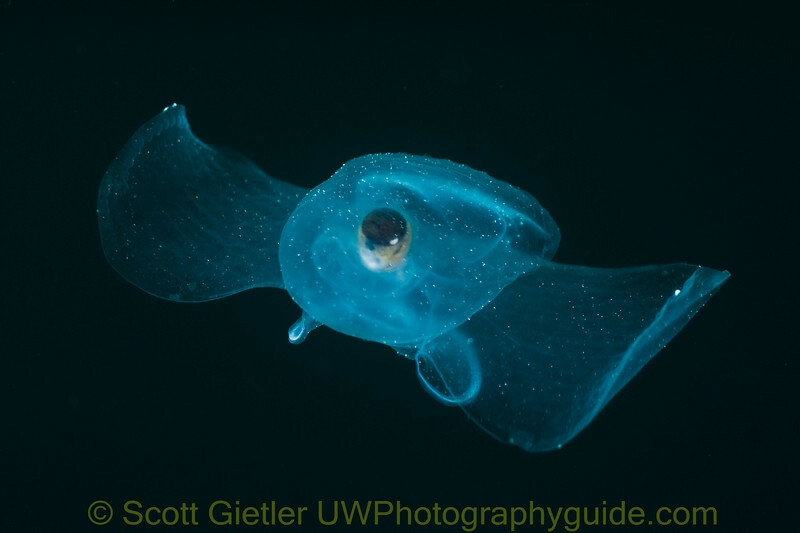 Swimming away from the anchor line and almost losing sight of the line can be scary, and it can happen easily with an exciting subject like a Pelagic Gastropod. Try it out near the surface before you descend, so you know what it's like. You'd be surprised how far you can "pull" the anchor line towards a subject if needed. As you descend down, think about how you would dump your weights if you ever had a serious buoyancy problem (this is really a last resort though). Run the scenario through your mind a couple times, and practice the motion with your arm. This way you know what to do if ever had an emergency and started sinking too deep. Also practice orally inflating your BCD. If you are on Nitrox, you must be mentally prepared to drop your weights if you ever lost buoyancy (BCD malfunction, puncture in the BCD) and dropped below your MOD. Don't go in if there's a lot of surge or it's very windy. Make sure you have a whistle and safety sausage on you. If the boat is moving, once you get underwater take a compass bearing so you know what direction to swim during your safety stop if you do lose the anchor. Let go of the anchor line; as you drift away, take a bearing back to the anchor line - that's the direction to remember. Now swim back to the line. If you do lose the anchor, or your tether breaks, don't panic- swim in the direction you had measured with your compass, come up quickly (but safely) and swim back to the boat. 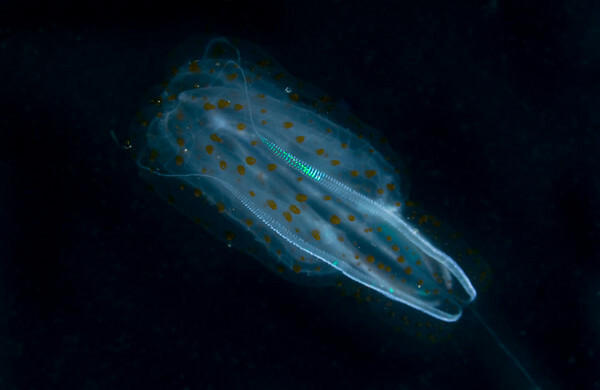 Bring a macro lens for small pelagic invertebrates, wide-angle for a chance rare encounter with fish, sharks, whales, molas, etc. As you see in this report, a wide-angle lens can also be used for close-focus wide angle photography of small invertebrates larger than 5cm. Hang out at different depths to see different species. I like using Nitrox because there's cool stuff at 70ft depth. Pelagic Gastropod,a Heteropod Carinaria japonica. All photos on the dive taken with a Nikon D300, Tokina 10-17mm fisheye at 17mm, F11, 1/320, ISO 400, cropped, heavy particulate in the water. The shell is at the top, the mouth at the bottom. In the middle is its pen*s (reproductive organ), so you can tell it's a male! Pelagic Gastropod, a Heteropod. The bright body part at the bottom center that looks like an oyster is its internal shell. The black spots at the top are its eye, this species is a visual predator. The bright area in the center above the shell is it's mouth and proboscis, which has radula and teeth. 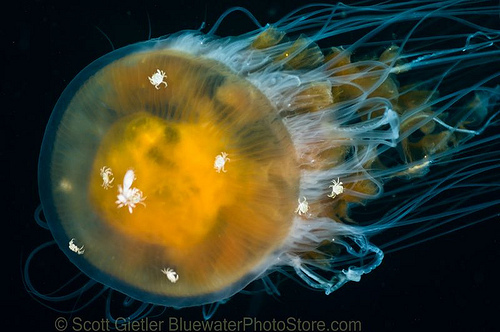 Jellyfish with several white crabs, and a white pelagic barnalce in the middle of the top of the bell. 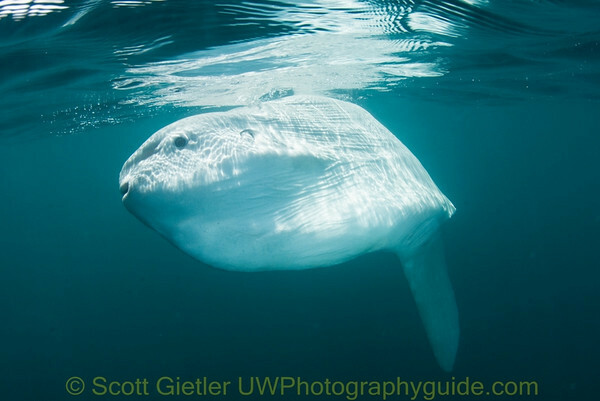 Mola-mola, a nice find in the open ocean! 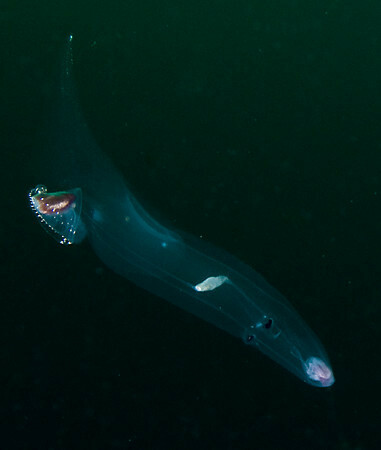 I saw several Dolioleta gegenbauri, a 5cm long Pelagic Tunicate (but not a Salp, different order) that has a large appetite. Although they floated motionless, when approached they rapidly moved away, making photography very difficult. 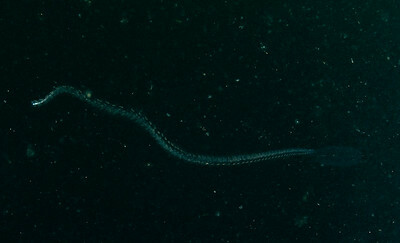 This Pelagic Tunicate, Dolioleta gegenbauri, looked more like a worm, and swam like a jittery snake. Submitted by Anonymous on Wed, 2012-07-04 06:11. Submitted by Anonymous on Wed, 2012-04-04 00:58. Submitted by pokeystar on Tue, 2010-08-10 12:35. Have never tried blue water diving, being based on the east coast of Ireland the green water experience tends to have serious visability problems. I did one swim through the blue between two reefs in Sharm (Egypt) an amazing experience of being surrounded by the sea. A further safety tip I would add is when diving in blue keep an eye on your gauges as it is easy to slip down slowly without a reference point. When you are at your dive depth DO NOT EQUALIZE ANY MORE as this is because your dropping! Simply check your guages and return to your target depth. If on NITROX set the Max PPO2 conservatively (1.4) and use a computer with an audible alarm. Submitted by Anonymous on Mon, 2010-04-26 07:16. 1. use a sea anchor. for those who don't know, its basically a cone shaped piece of materiel open at both ends and a rope tied to the wide end. slows the drift of the boat, which is usually faster than you due to the wind, though currents can change this. 2. cover yourself. 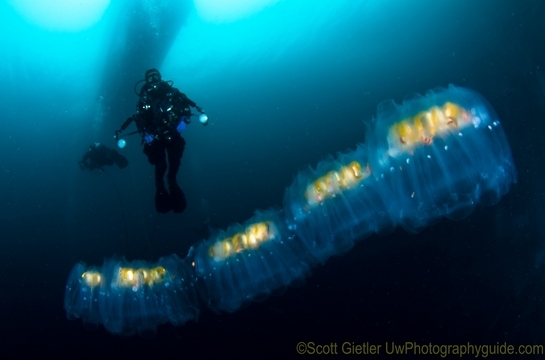 maybe this is common sense when diving in jelly country, obviously if its cold water, but here we get a few nasty stingers. a full suit, gloves, hood, boots or socks etc is key even in warm water. I've been stung a bunch in open water, though none too severe. once i popped under a bed of seaweed to find myself surrounded by hundreds of sea wasps (small box jellies), quite a harrowing 30ft swim back to the boat. Submitted by scottg on Mon, 2010-04-26 09:54. Chris - thanks for the 2 excellent suggestions. We actually purchased a sea anchor last night, after determining it is a must have for proper blue-water diving. This past weekend, the wind picked up, and it became difficult to photograph the jellies due to being pulled through the water. Cover yourself, another excellent suggestion - esp. for warm-water divers. In Southern california we don't really have a choice, we are always fully coverered :) I actually recommend this for all underwater photographers, even if you are not in "jelly country". Submitted by Anonymous on Wed, 2010-03-17 20:37. Very cool Scott! I can't believe you got those shots (even if heavily cropped) with a 17mm fisheye! Submitted by Anonymous on Wed, 2010-03-17 11:21. Submitted by Anonymous on Tue, 2010-03-16 13:06. Amazing. I will have to try a blue water dive sometime. Submitted by Anonymous on Tue, 2010-03-16 13:00. Submitted by robin mcmunn on Tue, 2010-03-16 12:37.